Disney’s Epcot Greenhouses are beyond amazing! 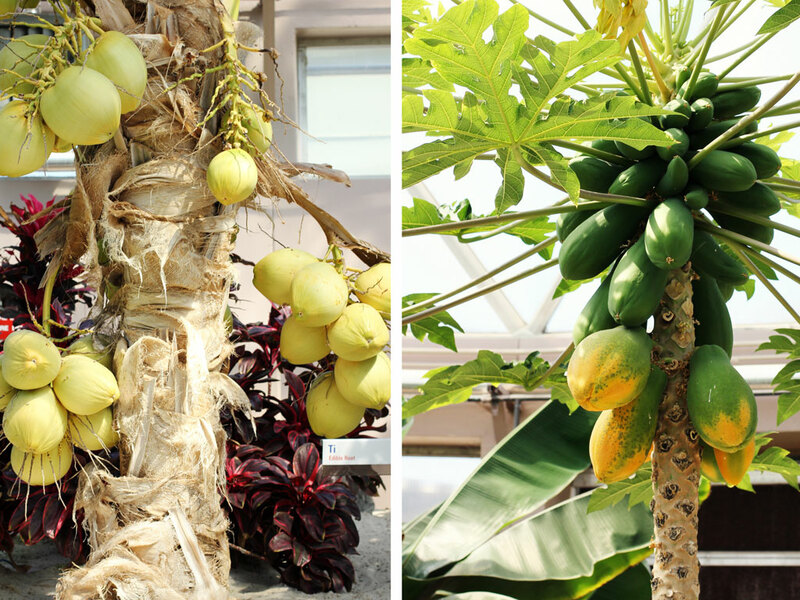 Here at the Sustainable Agriculture and Research Center at Walt Disney World they grow the most amazing things! 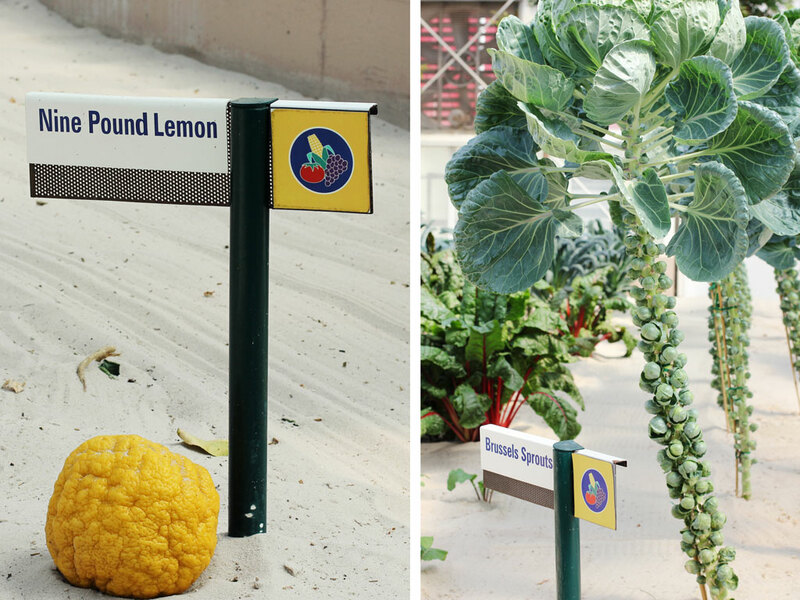 Fruits and Vegetables are grown in the air, in the sand, and moving around on conveyor belts 24/7. They grow vertically, in spirals and in cool containers. They are even grown above pipes. You name it, it’s growing here. Have any of your gardens ever looked like this? You can find all these amazing plants in the The Land, a tour ride in Epcot International in Walt Disney World. In addition to working with Hydroponics and Aeronautics, they have also partnered with both the U.S. Department of Agriculture and NASA on various projects. 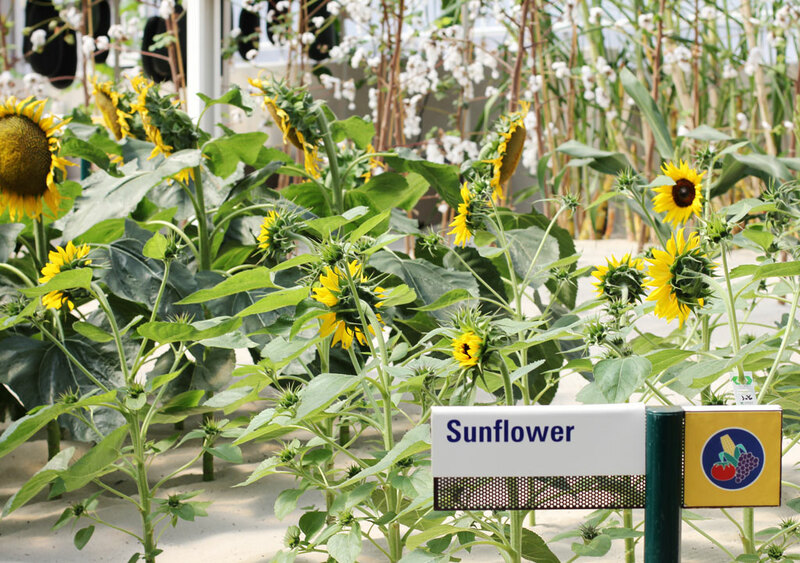 One project involves developing ways to grow gardens in Space for long journeys. We came across this 9 pound Lemon. They say it tastes the same but makes about a gallon of lemonade! I have never seen Brussels Sprouts look so beautiful and exquisite in my life. I am ready for a nice big refreshing salad about now. How about you? If it has been over a year since you have given the blog a change, it is time to give it face lift! Items like your header, widgets and especially your image! Your image should be current and recognizable. Readers are coming to your place of community and seeing the same material and eventually will get bored. It will make your material feel stale by not giving it an update once in awhile. Think about your favorite magazines, look at how they keep changing their look….it keeps you on your toes wanting more. For our friends who read the posts by email or any of the feeds, would you do me a favor and come to the blog for today. I would love to know what you think of the new header and background I designed. You will also see an updated head shot of me…big sigh!! I only like to be in back of the camera, not in front! But I knew it was time. You can view this two places, the bottom footer and the “Meet Laurie” page. You might be asking why did you take out the images of the top header? The reason…this is a photography blog and the header images were not complimenting with the images on the posts. Most of the time, I felt like it was fighting against them for attention. So with that said, changes came about. I hope your weekend was delightful and not a stressful one for you. If this is your first or second time to visit, we would love for you to join us here at Pride in Photos. Please fill out your email and they will come directly to your inbox. We promise your email is safe with us…pinky promise. Aren’t weekends just the best? Beautiful and healthy garden. Stunning pictures. Nice post..but the new header is devoid of colors..if that was intentional to make your photographs better..then it is good..otherwise..I find the style too pale. Yes, it is purposely done…so the photos stand out on the post. I love comments and appreciate hearing them. Have a great week. Well, I never saw the old header, but I really love the one you have now. The use of different fonts, the colors, great work! I need to put together something like that for myself. Thanks for checking out my site and liking my post. Take care! Your post was fascinating. Loved the images. The idea of growing gardens for space travel really grips me, and your new look looks new and good. What an amazing garden. It looks as though everything is growing in sand. Is that sand? I do love the new look! The header is very fitting and those smashing photos are really tasty to the eye as well. Thank you for sharing! Elizabeth, I wonder if any of us think we are pretty enough for the camera…sad but true☺ Thank you for your sweet words…you look lovely in your gravatar image. Lovely walk at the Disney gardens, Laurie. 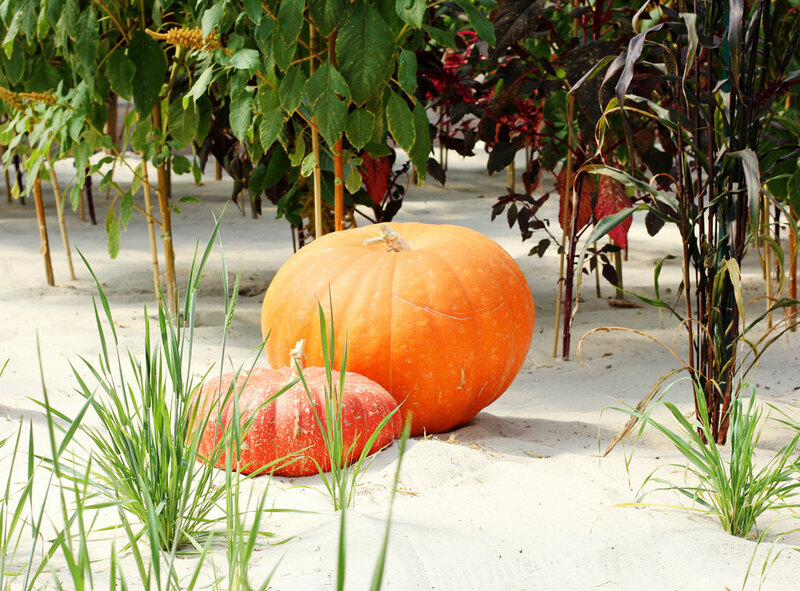 I especially like the pumpkins/gourdes in the sand. And you your new header is fabulous! Thanks for sharing in Walk and Click Wednesday! I like your header and your advice. Will try to update mine this weekend. Oh, to have a garden like that…! Oh I wished we lived in warmer climate! Beautiful pictures! I wish my garden looked half that good 🙂 You take great pictures! I have never heard of this part of the Disney conglomeration!!! Wow!! Now I want to spend a few days there!! Your images are so beautiful!!! What gorgeous pictures! Ok- now I need to garden. Hoping to get my tomatoes in the ground thins weekend ;0) We’re also ripping out the kids’ play structure which they no longer use and putting in planter boxes. It should be a bountiful year. That is a beautiful garden. I like the site design too. Such beautiful pictures, and I’ve never seen brussel sprouts look so good either! I like all of the changes, and the new picture is great! Love the new look – so fresh and clean! 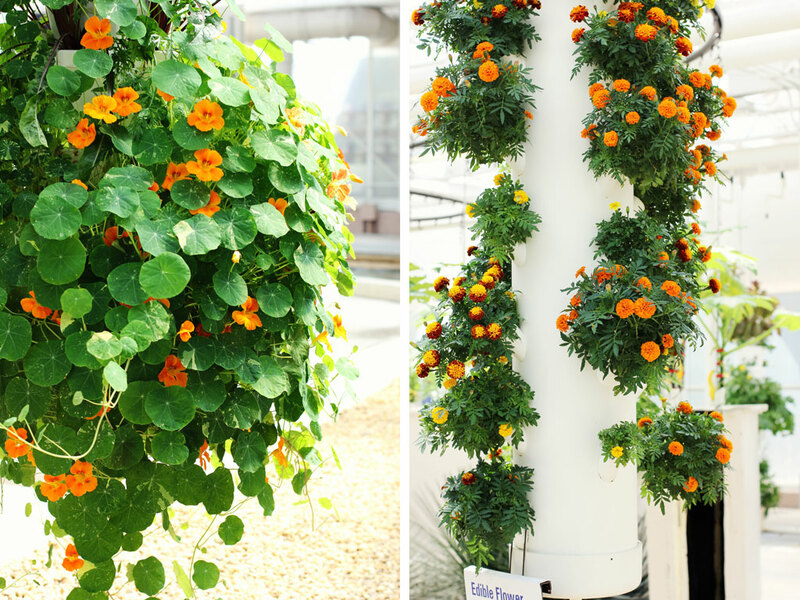 And love your orange collection – the orange flowers and the orange pumpkin look great against their white background. Oh yes, everything, including your new header is delightful!! I don’t know if I’ve been to your blog so I can’t comment on the new banner. But, your photos are stunning… especially love the sunflowers & that lemon… oh my gosh… wonder how it tastes? I love the new look, especially the gray and understated background. I like the new look of your blog. Beautiful head shot, but I miss your lovely smile! Joyce H.
What incredible images, and to think we may (someday) grow produce in space; remarkable…! Hi there! Love the photographs! I’m visiting from http://www.artistic31mama.com and the Mom’s Monday Mingle. Glad to have a chance to browse through your photos! Thanks for participating in the blog hop. I’m following via Pinterest and Facebook. Have a great week! Yes to the new design! It’s elegant and simple. Can I hire you? (only half-kidding!) My favorite of the photos is the 9-pound lemon. Just so amazing! I am always fascinated by how they grow them at Epcot. Gorgeous photos… I love to buy brussel sprouts on the stalk… they taste so much better. And if my portrait looked that good I would change my photo too!!! But my shoes are definitely my best feature, LOL!! Oh these images really get me excited to start gardening. Hi Laurie … this is my first time visit to your blog and so I can’t compare headers but I agree with your comment about the header photo not complimenting blog photos …. I find this is often the case. I love the simplicity of you current header. I love the new redesign! when I see posts like this…including my favorit flower(eastindian cherrie,i use during summer in my home made salads) I get so excited. I adore your new look. It is fresh and modern and sophisticated and goes really well with your images. And this is a fabulous post. You did a great job of capturing the gorgeous tones and shapes. Thank you Sherry…I know you set your priorities high…so really appreciated hearing this from you. Not even in my dreams, do my gardens look like this! Lisa, this means alot coming from your professional opinion girlfriend! Lovely happy pictures, as always! Love the new look of the blog, Laurie! It is cleaner and allows your posts and photos to shine. And the new head shot, fabulous! Gracie…that is a super compliment coming from you!! Thanks my friend. Wow, what a garden!!! Fabulous one!!! Great shots!!! Gorgeous shots of all these lovelies! What an interesting garden, is it all hydroponic? Not all of it…but it is amazing isn’t it? Love your update! Looks very inviting! I’m currently saving up for a new look, but it may take awhile. :). Love this section of Epcot. It is impressive. 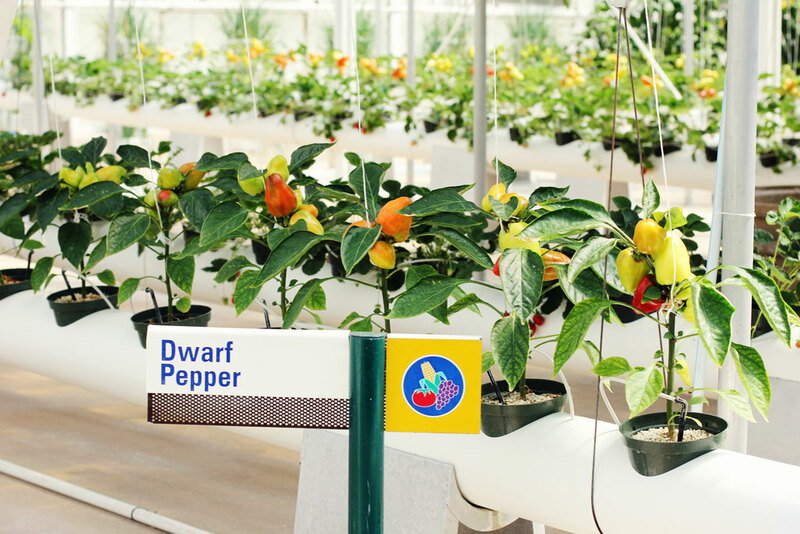 Wonderful photos — I love the dwarf peppers!! Hi, I like the layout of your blog a lot. I think going with a neutral background was a good choice, it helps your photos “pop” The one thing about your logo that bothers me a little, and I am being picky here, is that the letters have a bit of a square edge to their outline, almost like little blocks. I would prefer those edges smoother, I think. well that is something I never noticed…thank you. Love your makeover so pretty and love the shots of Epcot I visited from the UK about 6 years ago and remember seeing a Mickey pumpkin !!! The greens and yellows of the fruits and vegetables at Epcot are captivating! Such color! Good suggestion about updating our blogs … yours looks great! wow! now i want to go back to Epcot. it’s been years since i’ve visited. amazing plants. fascinating post and beautiful pics. happy day! Wow an amazing place, I’ve never been. I like all your photographs, but my favorite is the one of the 2 pumpkins. Blessings! What an amazing garden. It bears almost no resemblance to mine. How fun to visit there. great photography and great fresh look to your blog! Edibles never looked so good! I like the sturdy name tags too. I much prefer the new look. I think it is much more professional looking. And as you said it doesn’t compete with the photos in the current blog post! Oh! I love the new ‘mug’ shot. The new look is beautiful and fresh! No silver bells in our garden, unfortunately. I was stunned to see how perfect everything is at WDW. Thank you for the spring clean up information! About your blog: I like the light tone of it. I am not sure whether I will keep mine in grey or if I will also brighten it up a bit. But I am probably going to change my header. You are right, the pic in the header does not always go well with the pictures in the blog. So I’ll have to create a nice logo or something for my header. Love how you redecorated your home on the web. I like your new look! Fresh and inviting. But what is remarkable about your blog is YOU! Love your artistry. Every post if full of beauty.